Scams – targeting individuals, businesses and companies. Australian travel and tourism businesses are regularly the target of scams that are designed to defraud them. Recently, there’s been a wave of scams directed at those businesses who have registered a trademark. What you get is an unsolicited letter in the post that features an image of your trademark, your personal contact details and a few words about your trademark in an international database. Included with this letter is a remittance slip, effectively convincing you this a bill that you must pay to support your trademark registration. If you read the small print, the only thing you’ll actually get out of all this, after you pay the exorbitant publication fee which is usually around the $1,000 mark, is having your trademark published on some overseas low profile website. What these scammers hope is that you’re so busy that you’ll simply pay the invoice without giving too much thought to it. Or that the invoice goes to the accounts department of your organisation, who will be under instruction to ensure the trademark remains registered. After all, if they have your personal name, address and trademark details, it must be a legitimate bill, right? Wrong…all those details can be viewed by any member of the public on the web via the federal government’s official Australian Trade Marks Online Search System (ATMOSS). Technically, they are probably not breaking any laws by using terms like “we recommend” and “if you want” and not stamping a “due by” date on the invoice. 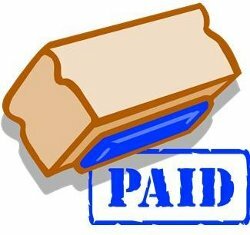 However, they are hoping that out of the thousands of these they send out, a few people will simply pay without a second thought. 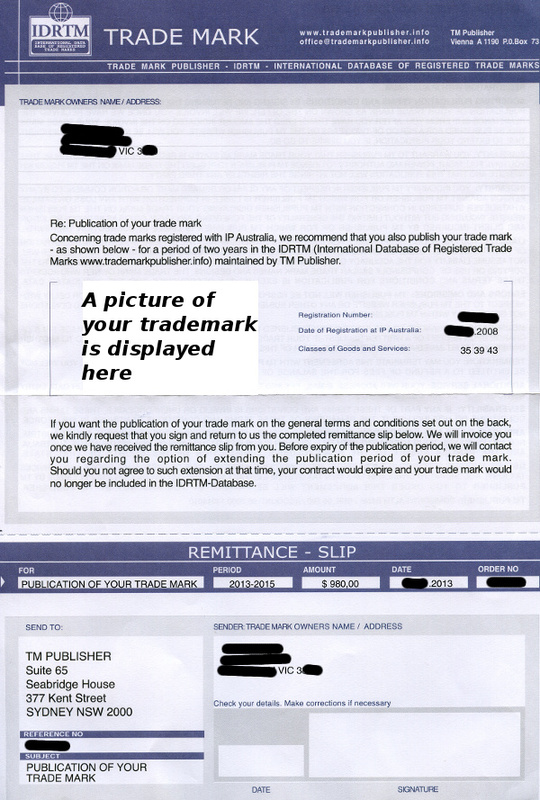 Below is a letter/invoice from IDRTM or TM Publisher, so you can be aware of what’s going on if you receive one of these. Scammers at work, requesting money for your trademark to be listed in an unknown international database.